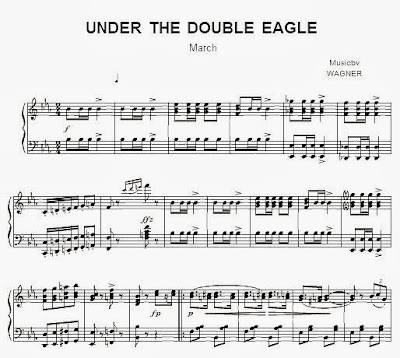 In the Wizard of Bayreuth's bicentennial year Wagner's rarely heard Under the Double Eagle march has been rescued from the archives in a notable new release from Warner Classics. The march is, of course, the work of the Austrian bandmaster and composer J.F. Wagner (1856-1908) and not his more illustrious namesake. But if my nuanced deceit generates some social media buzz about one of the least publicised but most rewarding classical releases of the year, it will have done its job. 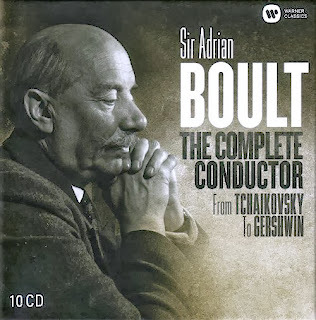 Under the Double Eagle is one of the slighter words in Warner's retrospective from their newly acquited EMI archive Sir Adrian Boult - the Complete Conductor. I previewed the 10 CD box in August under the headline This Tchaikovsky is the cat's whiskers. Now, having auditioned the new discs, I am moved to pronounce that Sir Adrian's Tchaikovsky surpasses the cat's whiskers - even Ginger's. If you want to hear recorded sound that has never been bettered - period - listen to the finale of Tchaikovsky's Third Orchestral Suite and let producer Christopher Bishop and balance engineer Robert Gooch take you right into the sonically outstanding Studio One Abbey Road where the London Philharmonic musicians are playing their hearts out for one of the all-time conducting greats. There are simply too many treasures in this 10 CD box to list. But in addition to the Tchaikovsky I would highlight Robert Simpson's First Symphony in astonishingly good 1956 mono sound, and, at a time when fanfares for uncommon women musicians are all the rage, Sir Adrian's 1939 recordings of two orchestral miniatures by Dame Ethel Smyth deserve attention. But most moving for me is Hubert Parry's sadly neglected Fifth Symphony. At EMI we knew that this would be the eighty-nine year old conductor's final recording. 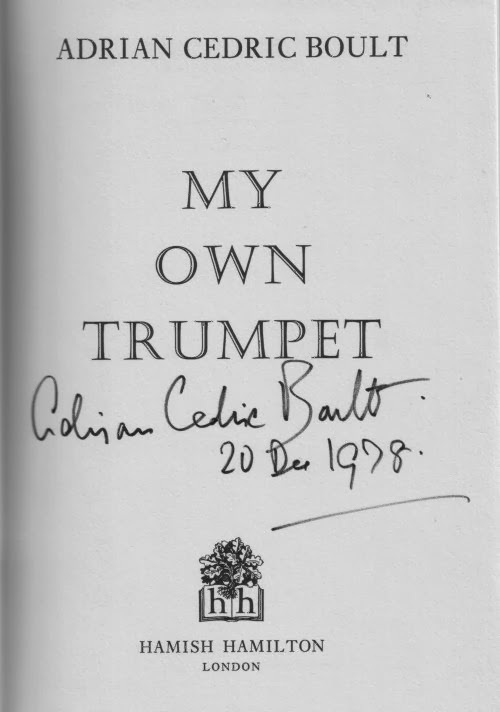 I was at Abbey Road for those last sessions in December 1978 together with my colleague Richard Bradburn, and Sir Adrian signed his autobiography for me - see below. Richard Bradburn retains his links with EMI and has done classical music a valuable service by masterminding Sir Adrian Boult - the Complete Conductor as well as the earlier From Bach to Wagner anthology and the 2011 remastering of Sir Adrian's Vaugham Williams Symphony cycle. Warner Classics has taken a lot of stick over their acquisition of the EMI classical catalogue; but let me put on record that, despite the absence of the dog and trumpet on the artwork, everything about this new release is a triumph. Particular noteworthy is the excellent newly commissioned booklet note by Martin Cotton which gives much deserved credit to the role of Sir Adrian's producer Christopher Bishop. My thanks go to Andrew Ousley in Warner's New York office who flowed me a review copy. Andrew is one of a new generation emerging at the major record labels who realise that classical music needs to look to the past as well as to the future. Sometimes when I am banging on about Sir Adrian's Indian Summer at EMI I think I have become a boring old fart. Now, having listened to this new retrospective I realise I am not a boring old fart, but, rather, I am dead right in thinking they don't make 'em like this anymore. Also on Facebook and Twitter. 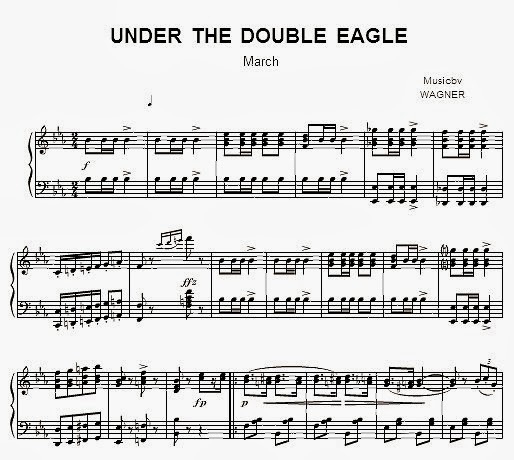 Under the Double Eagle score via Musicnotes after gentle retouching. Any copyrighted material on these pages is included as "fair use", for the purpose of study, review or critical analysis only, and will be removed at the request of copyright owner(s).